The new brick Dalhousie. Changes in Halifax. Archibald MacMechan. Difficulties of finance. Halifax Medical College and Dalhousie. The Law School's peculiar year. Shifts in curriculum. Student life and Senate discipline. Dances. Death of Charles Macdonald, 1901. "The building was ready to be inhabited by mid-September of 1887. It was only the first half of a building eventually supposed to be double the size. The present one was big enough, said President Forrest, for a good many years to come. 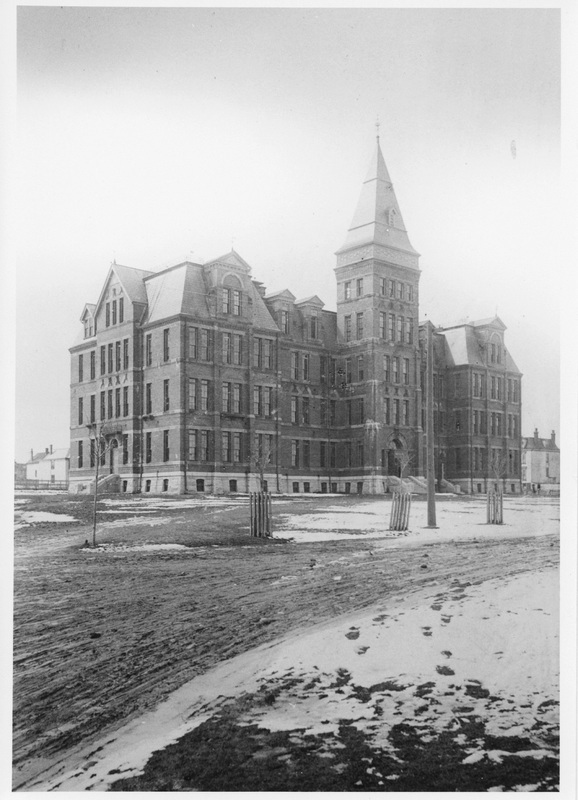 He bravely claimed that the building would be the equal of other such buildings in Canada, though, he noted, the University of Toronto buildings, built by the Ontario government, were costly and ornate. 'But we have no money to lay out for expensive adornments, or costly architectural designs.' Dalhousie was built from the city’s $25,000 payment for the Grand Parade, from Sir William’s gift, and from whatever private money the Board of Governors could scrounge from a Halifax world not replete with millionaires. And even wealthy Haligonians had a tradition of being close-fisted with their money. "The grounds showed the penury. There had been no landscaping, no trees; the ground was mere cinders, stones and dirt. The yard was enclosed with a large fence, with breaches soon made in it by impatient students. The cinder yard could yield up the odd empty tomato can, decayed orange, or dead cat. It was the wet and the mud that created the problems, 'this yellow, yielding, yeasty campus mud,' as the Gazette put it. Mud-scrapers were positioned on either side of the main door; their foundations are still there, anchored in the granite. One streaming day, while water was sluicing down Morris Street, President Forrest stood for an hour in the wet cautioning students not to use the usual route if he or she wanted dry feet. "Once inside the building, the students enjoyed the space, the first in years. After having been 'mewed up' as the Witness put it, in the old building, the wide corridors and staircases gave a new sense of amplitude. Enrolment in 1887-8 was 191; in arts (that included science) there were eighty-eight regular undergraduates and fifty-six general students; in law there were thirty-eight undergraduates and nine general students. Halifax was well represented. Of one hundred undergraduates in arts in 1889-90, twenty were from Halifax..."